10 Jalan Binjai, Kuala Lumpur. Business hours: 7.00am to 10.00pm. Especially for Ramadan, the PNB Darby Park culinary team has prepared a buffet for everyone at The 39 Restaurant. Whet your appetite with a range of dishes consisting of appetisers, soups, main course and desserts. With four rotating menus, guests can choose from 100 different types of dishes prepared by chef Azri Abdul Aziz and his team. The buffet features the rich flavours of Malaysia inspired by its various races. 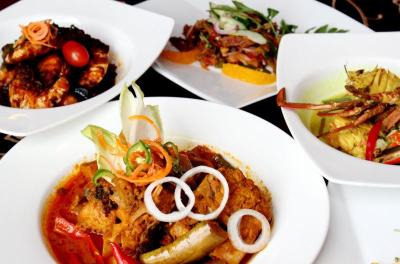 Chef Azri said their Ramadan promotion also attracts plenty of non-Muslims, thanks to the spread that offers a combination of Malay, Chinese, Indian and Western dishes. After a day of fasting, ease yourself into soothing hot soups such as Sup Ayam Kampong, Sup Bebola Daging, Sup Bebola Ayam and Sup Ekor. 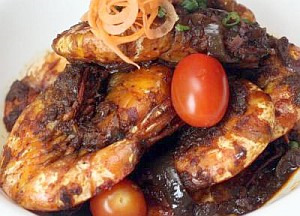 Spicy affair: The mouth-watering Sambal Udang. Then move on to the side dishes like lemang, ketupat pulut, serunding ayam and daging, Kerabu Mangga and Kerabu Taugeh. One of the highlights of the buffet is Kari Kepala Ikan that can be eaten with Roti Bengali. The curry, with its perfect blend of spices results in rich flavours. Later go for the Roast Lamb, where the juicy and tender meat is served with mint sauce, and it will surely make diners go for seconds. Look out for traditional dishes like Ayam Sambal Cili Kering, Sambal Belimbing and Mangga, Ikan Masin Lemak Nenas, Ketam Bercili, Udang Sambal Petai, Kambing Briyani, Siakap Tiga Rasa, Sambal Tumis Sotong, Daging Masak Merah, Asam Pedas and Sambal Tumis Sotong. Other dishes to try include putumayam with palm sugar and fresh grated coconut, rojak mamak, yong tau foo and Pasta Carbonara. Dessert lovers will not be disappointed with the selections available. Take your pick from an assortment of Malay kuih, Bread Butter Pudding, ais kacang, cendol, ice cream, cakes and pastries. The Ramadan buffet is available until Aug 17 from 6.30pm to 10pm. It is priced at RM99++ per adult and RM69++ for children aged between four and 12. This is the writer’s personal observation and is not an endorsement by StarMetro.